Dr. Matthew Smith, the newly appointed Director of the School of Communication, will not only be holding his new position but will also offer a new course this fall semester at Radford University entitled: “Graphic Storytelling”. The course enrollment caps at 20 students, and it has a current enrollment of 16. Smith teaches Graphic Storytelling every Monday, Wednesday, and Friday, from 10-10:50 a.m. As of now, Smith is set to teach the course every other semester but hopes that he has the opportunity to teach it more often. This course covers the principles that guide graphic novels with a focus on how the novels communicate their meaning. Students will also learn the history of graphic novels and, hopefully, develop an appreciation for the medium of graphic novels under the guidance of Dr. Smith. Smith’s personal life has a major impact on his desire to teach the subject. Smith has a deep love for comics and along with Randy Duncan and Paul Levitz, co-authored the class’s textbook, “The Power of Comics: History, Form and Culture”. Today, youth grow up with superheroes just like past generations, but most of the children do not read about Superman and Batman. Instead, they watch these iconic superheroes in the movie theaters or on television shows. 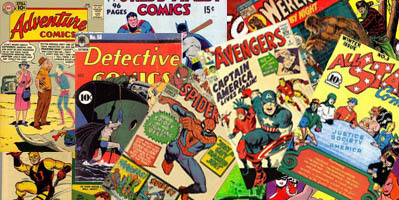 Along with understanding a new medium and gathering a greater appreciation for comic books, Smith takes his students to Comic-Con International located in San Diego, California. The opportunity is open to students of different majors as a way to pull in students who are interested in the different dynamics that Comic-Con has to offer, while also gaining college credit. Perhaps more than any other genre of entertainment, the fantasy and sci-fi genres require the most dedication and the greatest scope of imagination. Unfortunately, fantasy and sci-fi are often looked down upon. The reasons can vary, but they generally get a bad rap for being campy or having a fanbase that is simply neurotically obsessed about the genre; that factor I won’t deny. Concerning the camp, you do have to be willing to suspend a great amount of belief to accept the world of fantasy and sci-fi. After all, we are talking about genres where people summon flaming rings of mind energy and gravitic warp engines are readily accepted. In my experience, the most overt trivialization of fantasy and sci-fi was actually during my senior seminar project in college. As my fellow graduates were presenting their 20 minute presentations, one student was presenting on a topic roughly as follows: Is Frodo the true hero of the Lord of the Rings? No, Aragorn more explicitly follows the path of a hero. The student froze- he didn’t have an answer. For what seemed like five minutes, he stumbled on and on, unable to come up with a decent answer to the professor’s question and, ultimately, it was never resolved. I have no idea whether this professor was sincere in his opinion that fantasy is worthless. He had a reputation for asking “gotcha” questions, but that is neither here nor there. The true question is why would he feel it necessary to ask that question? Are fantasy and sci-fi worthless trivial pursuits that sully the name of good literature? I’ve yet to discover what good literature is. That requires quantifying something that’s a personal feeling between a person and their own tastes as a consumer. The answer I desperately wanted to shout from my seat is that literature began as fantasy. Fantasy, for human experience, is a seminal piece of storytelling. Whether you’re a religious person or not, there are gods you do or do not believe in. I imagine that the greatest majority of Americans and people in the world today regard Norse and Greco/Roman mythology as just that– mythology. However, for those people, these gods lived and breathed in the world. Fantasy is important because consumers love it. It asks us not to look at the real, but to look at the unreal and fathom how such impossible things can be possible. If you are engrossed in a realistic murder mystery set in modern day New York, little suspension of disbelief is needed. These things can, and do, happen all the time. However, for fantasy and sci-fi, more willingness to suspend disbelief is required. Fantasy and sci-fi are important because we live and breathe it. The most popular movies at the box office during this millennium are superhero movies and Peter Jackson’s take on J.R.R. Tolkien’s Lord of the Rings. Fantasy and sci-fi matter because the masses love them, and more importantly, humanity has always had an affinity for these kinds of stories. Gods, monsters, demons, elves, and dwarves: they all have much more in common than what first meets the eye.